Atticus continues his lethal war against the vampires – old enemies of the druids who had nearly succeeded in wiping out druidry 2000 years ago. 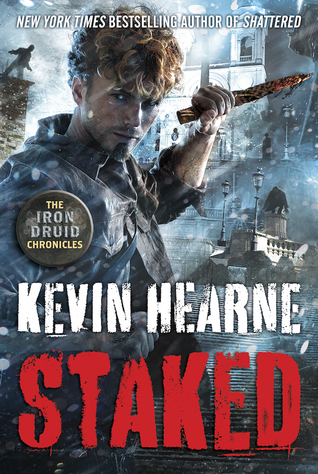 Now Owen is opening his own school for new druids, it’s time to fight the vampires to a new peace – or extinction. Owen and Granuaile have issues of their own, Owen building his school while Granuaile pursues her long festering family issues as well as continuing to fight against Loki’s scheming as they’ve all been dragged into the fight for Ragnorak. Atticus is interesting in that he is the oldest and most powerful of all three of them – yet at the same time the one with the least plans and even the least freedom. He has spent two thousand years hiding from Aenghus Og, making enemies and collecting baggage – since killing Aenghus Og Atticus has earned so many debts, so many favours and launched on so many crusades (including the whole Norse Ragnorak issue and the current war against the vampires) that he can’t even begin to make plans for the future. When Granuaile comes to him with her environmental aims he not only doesn’t understand her (given he’s from a very different time and is far more focused on supernatural threats than human defilement of the world) but because simply having space to do something he chooses seems pretty alien to the way he’s living and has lived for two millennia. Even now with Fand out there he is, again, under threat. Atticus is a man under siege, often having to make bad decisions to try and solve the problem in front of him, fully expecting it to come back and bite him but not seeing another choice. It’s interesting how Atticus can be such a light, happy character yet have this rather bleak undercurrent. While Granuaile is very energetic and passionate and driven – but also very personally invested. In some ways she’s much more connected to the modern world than Atticus or Owen – she’s also relatively young and still growing into her life and role. She still has issues with her step father and his callous polluting of the world which is very emotional and personal for her, which involves a lot of growth, missteps and learning – in fact I think a lot of her story this book is Granuaile deciding what she’s going to do with her life and how that doesn’t involve Atticus. It’s not that she’s breaking from Atticus, they still care for each other and spend time together – but all of Granuaile’s plans and growth are her own: her own battle against Loki, her own deal with the witches, her own plan for the future, even picking her next language to learn (druids have to learn languages for different head spaces) all separate from what Atticus suggests or would do. And we have Owen who is, in many ways, even more personal and insular – he isn’t really in a place to deal with the world as a whole since he’s so separated from the past (and so often this is hilarious, especially when OBERON is schooling him on how to navigate the modern world. Yes. Oberon. It’s hilarious). Owen has more close family ties than Atticus or Granuaile and, given he remembers a world when druidry was thriving, he wants to rebuild that (ironically something which somewhat forces Atticus’s vampire war). Owen’s also a good metric for how accomplished Atticus is – it’s hard to see through Atticus’s fun, self-depreciating demeanour – but Owen makes it clear that his former protégé has become incredible skilled over 2,000 years of existence. All of this is to a backdrop of the awesome world setting of these books and the excellent, and frequently hilarious, writing. This series has been one of our favourites from the very beginning and it continues to be that same level of excellence. Laksha is… complex. She is a powerful witch who has previously been called on through the series because she is just that awesomely powerful, terrifying and quite willing to make a goatfucking joke. I like her. She’s also a woman who has a very dark past full of a lot of terrible acts she feels she desperately has to atone for… and when Granuaile tries to talk her out of that Laksha is quick to point out that she is intelligent enough to know her own choices and that Granuaile doesn’t understand her cultural or religious choices and that it is, equally, not Granuaile’s place to lecture Laksha on those choices or judge her on them – or on the culture she is part of. I can understand that. At the same time we have a western author writing a western character trying to save an Indian woman from “cultural” misogyny. It’s dubious, from this standing, to write this shallow and brief depiction of a foreign culture as misogynist and, well, backward. Especially appearing so briefly, it’s hard not to see this as a dismissive bit of cultural superiority dropped in. Lasksha, with her brief appearance, is one of the main POC in this book. We also have brief appearances from Mekere, an Ethiopian seer and an appearance from Shango, god of thunder (a powerful god because his believers are spread and still believers). We also have a large amount of diversity among Owen’s new students showing that the next generation of druids will be from many races and nationalities. I just can’t say any of these really count as a major role. Or even if all of them were mooshed together whether they’d be enough to be a major role. Or significant minor role. I am glad to see a return of the Hammers of God, the Rabbi kabbalists who have become a more interesting force than the zealous warriors of their youth. It’s nice to see some relatively simplistic antagonists get a layer of nuance. I also like how Perun had a little development – he’s been presented as something of a buffoon, simplistic and bombastic in language and a bit silly and not that bright. Until Granuaile switches to speaking to him in Russian where he is erudite and well spoken – and we realise that Perun has been somewhat dismissed as a fool not because of intelligence, but because of a language barrier. It’s a nice element. LGBT wise we do technically have 2 gay werewolves who are referenced but, at best, seen only for a line. They’re not exactly characters… so much as references. I also don’t remember it from the past book – but apparently the villain (including the unnatural magic, soul destroying villain) are gay. Well… thanks for that. Diversity isn’t really this series’s strong point which is a damn shame. I really just want to praise and praise and praise. I want to just love the series without the slightest criticism. I want to love it all unreservedly. I want to just revel in the awesomeness of it and enjoy every last word – and I do. This is one of those books where, when I receive it, I stay up all night reading because I simply cannot possibly put it down. Beyond diversity, my main sadness is that I now have to wait until the next book is released. Will We Ever See The Teen Wolf Video Game?